Here is another late entry into the weekly challenge brought to us by the lovely Rochelle Wisoff-Fields. The mountains of paperwork had reached mammoth proportions. Deluged by policies, amendments, white papers and term sheets, her desk had disappeared long ago. There was a knock at her office door. The air hung heavy with expectation, desperation even. The timid girl entered, hovering near the door. “S-sorry,” she said, her voice barely above a whisper. She darted forward, placed a Perspex sign on top of one of the paper towers and left – quickly. Clare picked up the sign and rolled her eyes. “‘Head of Environmental Policy’ indeed,” she muttered. Maybe climate change will blow away all the papers. Very funny story! Excellent! Which reminds me…I’d better stop asking for paper receipts…and go with emails instead. At 65, it’s difficult to undo longstanding habits…especially when I’m hung up on security breaches. I should let go though…for the environment’s sake. Oh yes, old habits die hard… and I was a little suspicious the first time Apple offered to email me my receipt from their handheld gizmo… all this new technology! It certainly is hard to change (I’m also paper led…). Nice message and an original take on the prompt. That’s a no-win for all concerned. Best pack it in and go hiking. I’m sure she’s an avid recycler, darling. Plus, she goes on Facebook and “Likes” all those posts about saving the planet, so it all evens out. lol ironic indeed! 🙂 funny. Great little story. I love a bit of irony! Very funny, Freya! 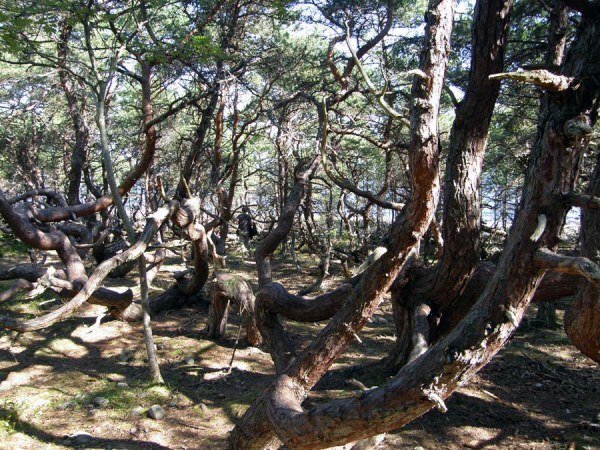 And bureaucracy is just as twisted as these trees, too. Perhaps she can shred the sign and use it for mulch. 😉 Love your unique take on the prompt. Freya, exquisite irony here and an excellent story. Well written Freya, definitely very ironic. Love the voice in this, the irony and desperation both so well done. Irony…I love it! Nicely done.